The tread wear grade is a comparative rating based on the wear rate of the tyre when tested under controlled conditions on a specified government test track. A tyre graded 200 would wear twice as long on the government test track as one graded 100. Your actual tyre mileage depends upon the conditions of their use and may vary due to driving habits, service practices, differences in road characteristics and climate. Note: Tread wear grades are valid only for comparisons within a manufacturer's product line. They are not valid for comparisons between manufacturers. Traction grades represent the tyre's ability to stop on wet pavement as measured under controlled conditions on specified government test surfaces of asphalt and concrete. The Traction grade is based upon "straight ahead" braking tests; it does not indicate cornering ability. The temperature grades represent the tyre's resistance to the generation of heat when tested under controlled conditions on a specified indoor laboratory test wheel. 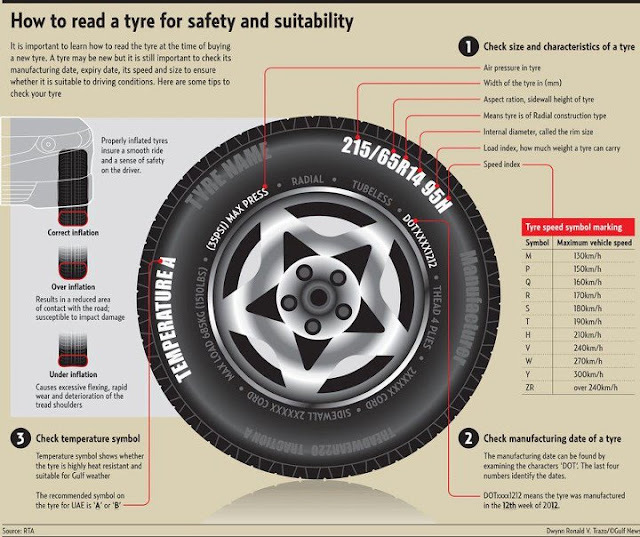 Sustained high temperatures can cause the materials of the tyre to degenerate and thus reduce tyre life. Excessive temperatures can lead to tyre failure.